Jack took a bow afterwards and then, once the clapping had subsided and the house lights had gone up, surveyed members of the audience from the side. Among the silvery, distinguished heads there was a lot of winking, a lot of confiding of patient fortitude and thin-lipped smirks, provoking a subtle mirth in the others. Another extract from Adam Thorpe's novel Between Each Breath which featured here recently and which is partly set in Estonia. 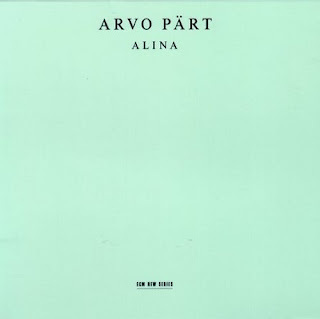 Arvo Pärt seems to be the current composer of choice for the literary set and his music also features in Tim Winton's award winning novel Dirt Music which is set in Australia. Header image is one of the very few ECM CDs not to feature out-of-focus black and white photography. Alina is ECM's essential 1999 collection of Pärt's sparsely beautiful music for violin, cello and piano, and the title work Für Alina provides a leitmotif for Adam Thorpe's novel. Recommended listening if you still need proof of Pärt's revelation that 'I have discovered that it is enough when a single note is beautifully played'. Now read about Arvo Pärt's contemporary classic, Passio. Oh, come now! None of Keith Jarrett's ECM recordings feature out-of-focus b/w photography, do they? Or Kim Kashkashian's? Perhaps I'm buying the wrong ECM albums all these years? They are the first three I pulled off my shelf. I agree other older Jarrett releases use in-focus photography, My Song, Dark Intervals etc. But the fuzzy virus has spread to Jarrett land. Ah, you got me. My mind leaps to the typeface recordings - Vienna, La Scala, etc. I think it's time to call a meeting with Manfred Eicher.